Thanks for visiting www.barry.ie! Here you will find all my latest jobs, a little about me and you can also subscribe to my jobs by email or by RSS. You can also connect with me by posting a comment, a job, or using linked in. I’d be interested in hearing from you if you are an employer or a jobseeker, or if you just want to connect. There was great interest at the Spring GradIreland Careers Fair on our Self Organizing Network (SON) Demo. The Demo, which uses a combination of lasers, servo motors and Arduino microcomputers, is a fun and interactive game for students to engage in. The purpose of the game is to demonstrate the complex work a network optimization engineer does to improve mobile networks and to show how Ericsson’s software products are working to automate that process. Everyone had a chance to play the game themselves and received a score on how accurate they were with their attempt at optimising the network. In the future, Self Organising Networks will be a critical enabler for the widespread deployment of mobile broadband technologies. Network complexity has reached the stage at which self-configuring, self-optimizing and self-healing functions are now indispensable for running a modern mobile network. Ericsson’s SON Manager is our innovation. This is an amazing technology that is being researched and developed in our Athlone site in Ireland. If you would like to be part of this and other exciting projects, we would love to hear from you. We are looking for a Senior Engineers and you can see our open positions here. If you are interested in seeing the demo in action (and having a try), to find out where we will be next, please follow our Twitter account. This is going to be a big year for our Software Campus in Athlone, Ireland. We will hire many Interns, Graduates and experienced Senior engineers, so I thought I would tell you a little about us. Read on for 4 great things you might not know! If your dream in college was to be somewhere where the entire software lifecycle is hosted, then the Ericsson Athlone Software Campus is the place to be. Here, you can truly innovate and your ideas can flourish. We have over 50 nationalities onsite in Athlone. It’s one of the many things that makes our office a truly special place to be. If you are a Software Engineer, Analyst, or Architect anywhere in Europe (or even further away), and are interested in joining us, we would love to hear from you. It’s the uniqueness you bring when you join , that we are delighted to have, that helps us continue to build the best software in the world. You can learn about Sowmya’s experience or joining us from overseas in the video below. 3: Athlone is at the heart of it! We are in the best place in Ireland – right at the heart of everything in Athlone! From here, you can do anything. You can enjoy serenity in the countryside, or the hustle-and-bustle of the city , go to the beach, cycle, hike, ski, go horse-riding, golf, water sports– the list is endless!). Best of all, we have a strong ethos of work-life balance, so you will have the opportunity to do all those things. Below is a great video about life in Athlone. Ericsson has over 42,000 patents which we have achieved by hiring the smartest people in the world and nurturing their talents to help them reach their full potential. As you might imagine from a global R&D centre with end-to-end responsibility, we are brimming with smart people on our team. You and your manager will continually work together on a plan to make sure you succeed, either through training, mentoring, special projects, exploring technology trends of other means. You can even take advantage of our scholar program, which includes fee assistance and extra leave for study and exams. Does this sound like the kind of place you want to be? If so, we would love to hear from you. You can see our latest positions and apply by clicking here. Tomorrow (May 21) is World Day for Cultural Diversity. Last year, to celebrate, Ericsson asked its employees for submissions for recipes for Ericsson Cultural Journeys Book. Ericsson has over 19,00 people in over 180 countries who speak over 193 languages, and this is a wonderful collection of food ideas from our people. Having tried most of them, I’d have to say the Turkish ‘Lady’s Thigh Meatballs from Emrah Onder is my favorite! It’s a fascinating insight and also a culinary delight – you can download a free copy of the book here: http://goo.gl/oUyXHo. And happy World Day for Cultural Diversity! I’m absolutely delighted that we have 4 entries from Irish colleges to the Ericsson Innovation Awards 2016, and I just wanted to wish them the best of luck, and also encourage you to vote for them! They are all great ideas, so I hope one day Ericsson can help make them a reality, as I really dislike queues, and the checkout, and you never know, I might even be persuaded to give up my “lone-wolf” motor-biker ways with PI and a Carparment! Voting is open until December 17. 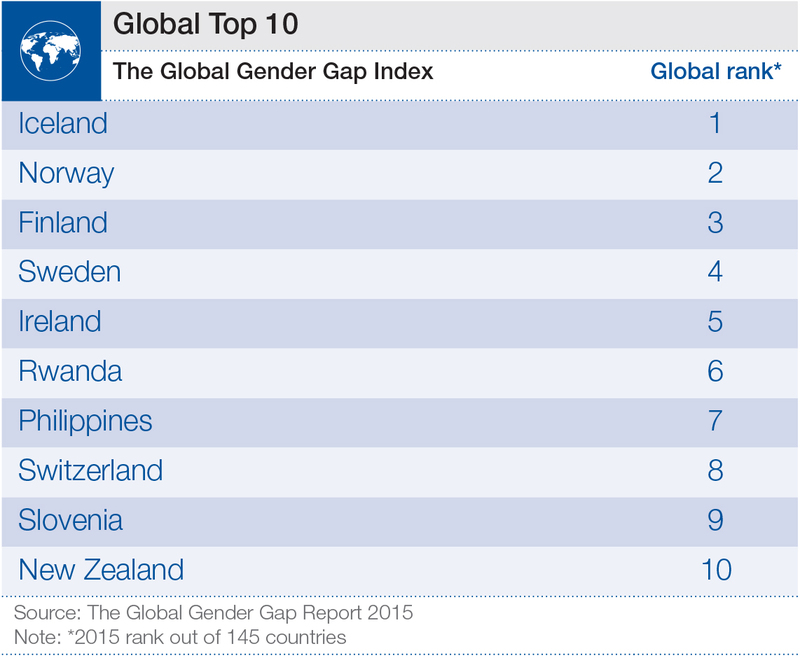 Ireland in top 4% Globally for Gender Equality. Delighted to see that The World Economic Forum has awarded Ireland a top 5 place globally for Gender Equality. As a country, we are not 100% there, but this is a very positive move in the right direction.